If pipeline is designed with three-layer factory coating, a similarthree-layer structure has to be provided for the joint area tobe coated. This is achieved by using TIAL-P two componentsolvent free wet epoxy primer which is one of the mostimportant components in three-layer protection systems. The two-component primer forms the first insulation layer. Itacts as an additional corrosion inhibitor, fills in microscopicdefects of the surface and largely improves the materialadhesion to the surface. Additionally if the epoxy primer isused, the cathodic disbondment resistance of TIAL coatingsincreases considerably. Advanced 'wet primer' technology allows to heat the pipesurface only once to the unusually low temperature with furtherprimer application and non-stop installation of TIAL materialswithout drying the primer to complete hardening. This is animportant advantage which largely reduces coating installationtime and considerably saves resources. By using TIAL coatings with TIAL-P primer, you will maintainthree-layer coating as easy as two-layer structure due to the self-sufficient primer sets and simplicity of primer application. 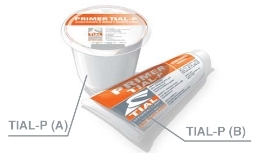 One TIAL-P primer set includes containers of component A(resin) and component B (hardener) to be used for insulationof one field joint or a branch. Size of each A or В componentdepends on size of area to be coated (pipe diameter, pipeportion length etc.) and is calculated by our experts to suityour specific needs. You will never need to waste your timecalculating mixing ratio of primer component or buyingexpensive pumps for extraction of components from bulkpackages.If pipeline is designed with three-layer factory coating, a similar three-layer structure has to be provided for the joint area to be coated. This is achieved by using TIAL-P two component solvent free wet epoxy primer . If pipeline is designed with three-layer factory coating, a similar three-layer structure has to be provided for the joint are to be coated. This is achieved by using TIAL-P two component solvent free wet epoxy primer.